Wall Street Journal: Looking to Double Your Salary? Try an M.B.A.
You are here: Home / Blog / Wall Street Journal: Looking to Double Your Salary? Try an M.B.A. Fully 75% of those who earn an M.B.A. switch careers, a new survey shows, and they can double their salary by doing so. 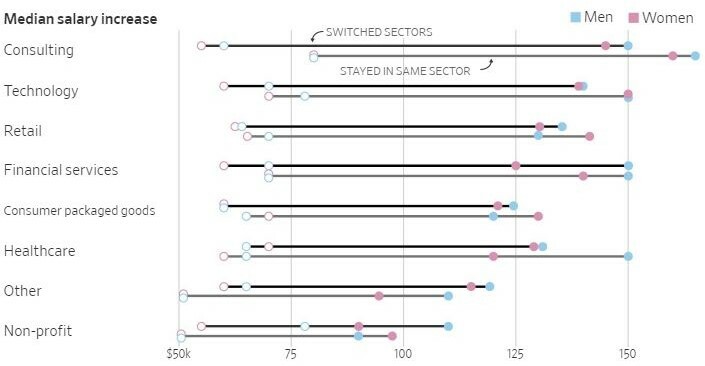 But the survey of thousands of graduates from dozens of U.S. business schools also reveals that the pay gap between men and women persists—except in the tech sector. At a time when the cost of business school is skyrocketing and enrollment in many programs is declining, The Wall Street Journal, in partnership with Times Higher Education, polled nearly 7,000 alumni who earned master’s of business administration degrees between 2012 and 2015 on their salary history and career-switching opportunities. M.B.A.s from the Yale School of Management, Stanford Graduate School of Business, Jones Graduate School of Business at Rice University, among others, reported making tens of thousands of dollars a year more after graduating from the two-year programs. The results show that the credential sought-after by generations of bankers and consultants still helps those graduates get ahead at work. The median salary for consultants who returned to professional services firms like McKinsey Co. or Deloitte Touche LLP after getting an M.B.A. was $162,000 a year, the highest pay in any sector, and a boost of $82,000 annually. Alumni surveyed in finance and tech jobs tied for second-highest pay, making $150,000 if they also worked in those sectors before business school. For those staying in the same field after earning an M.B.A., consultants earned the most, while those in the healthcare sector reported the biggest increase in their pay. The data also show that for most women who earned their M.B.A., a pay gap persisted. The median salary of women who worked full-time before entering business school was $63,000 a year to men’s median salary of $67,000, or 94 cents on the dollar. Both men and women reported more than doubling their earnings after graduation. In their post-M.B.A. careers, the median of those women’s earnings was $130,000 annually and men’s was $140,000. But for women who used the M.B.A. as an opportunity to switch careers, the pay gap narrowed. In tech, where employers like Alphabet Inc.’s Google and Intel Corp. have waged a public push to improve the diversity of their employees and managers, the gender pay gap virtually disappeared for M.B.A.-holders, according to the alumni survey data. Female M.B.A.s who broke into tech after business school earned a whopping 132% more than their previous salary, at $139,000 per year, compared with male M.B.A.’s 100% boost after graduation to $140,000 a year. More than 40 U.S. M.B.A. programs participated in the survey, though several high profile schools declined, including Harvard Business School, Columbia Business School and The Wharton School at the University of Pennsylvania. Of the 4,400 respondents with jobs in the U.S., three out of four said they changed fields after business school. Many used the degree to catapult themselves into consulting firms known for hiring M.B.A. talent in droves, or to find fresh starts in consumer products, healthcare or manufacturing. Around 5% of M.B.A. respondents swapped full-time employment altogether to start their own business. Out of 3,100 alumni employed in a new field after their M.B.A. programs, 25% said they moved into the technology sector, the most of any single industry. While banks and financial service firms have long recruited M.B.A.s, tech outfits like Amazon.com Inc. only started to heavily draw in business school grads a few years ago. 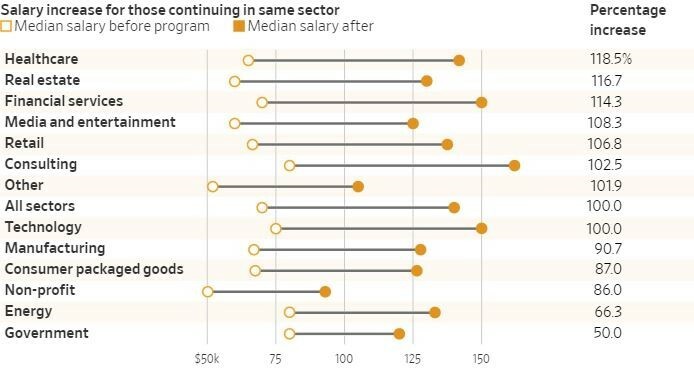 For some people switching to new sectors, the salary boosts were higher. M.B.A.s who went into consulting reported earning $84,000 more a year, while M.B.A.s new to tech earned an extra $75,000 a year, compared to a $70,000 pay raise for M.B.A.s who had already started their careers in technology. Still, many people in the generation of college graduates who entered the workforce in the immediate aftermath of the 2008 financial crisis are skeptical that the M.B.A.’s price tag, which has risen precipitously in recent years and now can run into the six-figure range, is worth the risk. A growing share of them are opting instead to seek professional growth in the historically strong U.S. job market. The number of applications to American business schools has declined for four years running, a trend that hit elite schools including Harvard and Stanford universities this year. 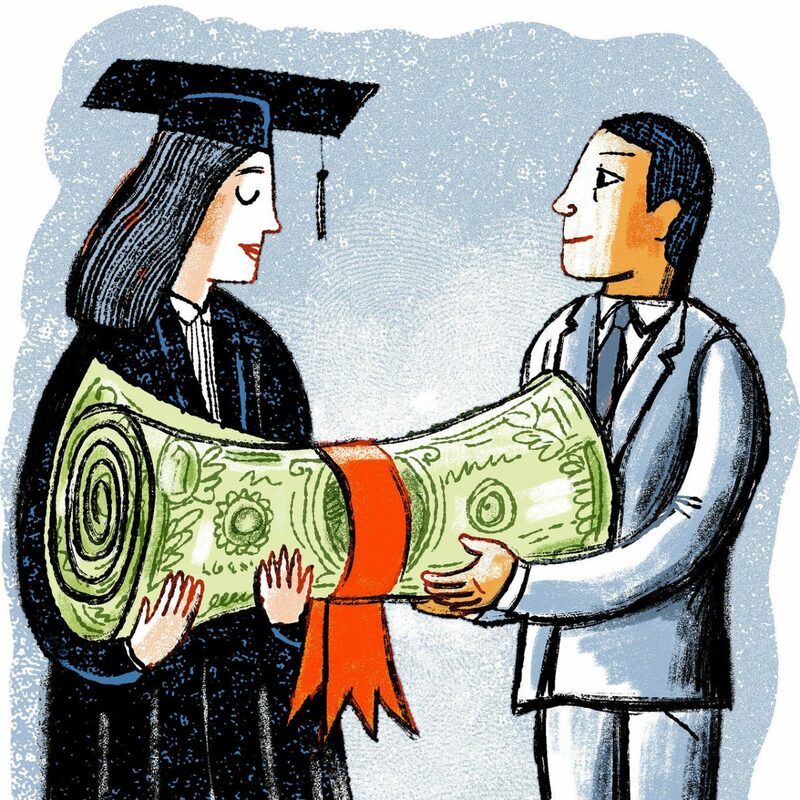 As an alternative, online M.B.A. programs and one-year master’s degrees in business have proliferated as a way to attract young professionals who are loathe to pause their careers for full-time studies or take on additional debt to fund another degree. And business school is not a golden ticket that allows everyone to pull off the dramatic career switch they dream of, several students said. Some companies that have traditionally recruited M.B.A.s, including foreign nationals who graduate from U.S. business schools, are slowing their offers amid tighter government visa requirements leveled in the past year. Vadym Trembovetskyi left his private-equity career in Kiev, Ukraine to pursue an M.B.A. at Cornell University’s S.C. Johnson College of Business in 2016, after watching friends who worked in European finance jump to bigger investment firms after completing their degree. The 32-year-old wanted to land a role in finance after graduating in May, but after submitting more than 200 applications for mostly U.S. positions in business development, private equity and venture capital he took a short-term position at Varian Medical Systems, a cancer-treatment and device maker, in Palo Alto, Calif.
Mr. Trembovetskyi said he senses that other employers may be reluctant to hire him without a visa. Still, he doesn’t regret getting an M.B.A., he said. “I think of this a long-term investment,” he said. But the clock is ticking. Soon, he’ll have to make enough money to repay more than $100,000 in student loans.